The global smart lighting market was valued at USD 6.7 billion in 2017 and is expected to witness a CAGR of 22.2% during the forecast period (2018 – 2024). The growth of this market is attributed to the extensive adoption of innovative technologies or instance strong intelligent systems, IoT, real-time monitoring of illumination and technological advancement in connected lighting. Moreover, increasing awareness towards conservation of energy is the major factor driving the growth of the smart lighting market, globally. Smart lighting has become one of the most popular solutions in the lighting industry that uses control system in order to control lights on the basis of several parameters such as occupancy, temperature, amount of natural light and movement. Energy cost associated with lighting is high as a result to which industries and government organizations are increasingly emphasizing efforts to decrease utilization of energy and thereby altering conventional lighting systems with advanced and efficient control systems in lighting. Automated lighting enables users to monitor tasks at an efficient manner along with flexible and economical lighting. Due to all these advantages, the smart lighting market is growing at a significant rate. Moreover, it has been observed that smart lighting is excessively being adopted in industries such as government buildings, residential, automobiles and industrial. Based on the product, the smart lighting market is categorized into the lighting control system and luminaries. Luminaries, which is further categorized into smart bulb and fixture, account for the larger share in the market, whereas smart bulb, categorized into driver & ballast, switch & relay, sensor, and gateway, exhibit the faster growth during the forecast period. Based on the source of smart light, the market is segmented into the light emitting diode, fluorescent lamp, high-intensity discharge lamp, and others. Among these, globally, LED segment held the largest share of 46.4% in the market in 2017 and is also anticipated to witness the highest growth during the forecast period. The smart lighting market on the basis of communication technology is segmented into wireless technology and wired technology. Among these two technologies, wireless technology is expected to witness the fastest growth during the forecast period owing to the elimination of wire utilization that is ultimately abolishing the requirement for protection and installation of cables. As a result, it has been observed that the cost associated with wireless lighting is relatively low and is flexible in nature as compared to wired technology. The wireless communication technology sensors help in developing an autonomous network that makes moving, updating, replacing and adding sensors convenient after the installation. Moreover, rapid developments observed in wireless technology are expected to drive the wireless communication technology smart lighting market during the projected period. On the basis of application, the smart lighting market is segmented into the indoor application and outdoor application. Among these two segments, indoor application is held the larger market share of 75.5% in 2017. The indoor application is further sub-segmented into commercial, residential and others. Among these subcategories residential applications is excessively being installed in accordance with an entire house or even for a specific room. Moreover, the market for residential indoor applications is expected to witness the fastest growth during the forecast period in the market due to the establishment of wireless technique. The commercial usage of smart lighting systems encompasses extensive implementation of these lighting systems in retail stores, hospitality and shopping malls. Replacement of existing lights with more energy efficient alternative lighting systems is helping to eradicate explosive consumption of energy. Development of infrastructure in order to convert cities into smart cities, modernization and increasing requirement for energy-efficient lighting systems, decreased cost and extensive adoption of LEDs, excessive demand for intelligent solutions for the street lighting systems and increasing emphasis for energy savings among government organization and consumers across globe are driving the growth of the smart lighting market at a rapid pace. Moreover, the development of smart cities is fueling the growth of the smart lighting industry due to use of embedded devices and sensor technology in various areas such as traffic signals and streets decreases the consumption of energy at the extensive rate. Smart city initiatives specifically focus upon the use of connected devices that enables streamlining the operations and conservation of energy that makes the living of individuals convenient and affordable. These lighting systems are thus helping the government organizations in reducing energy consumption, the cost associated with maintenance of smart cities and a lower rate of accidents at night with the connected street lights. However, the high initial cost of installation, security and privacy concerns and limited knowledge related to payback periods are the major factors hampering the growth of the smart lighting market. Globally, industry players in the smart lighting industry are leveraging market growth through the establishment of growth strategies related to organic and inorganic growth mechanisms along with the incorporation of several strategic partnerships by the key players occurring in this industry. 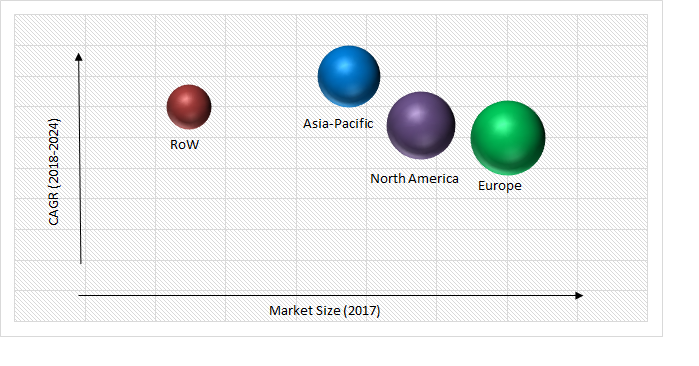 Geographically, Asia-Pacific is expected to witness the fastest CAGR of 25.1% during the forecast period in the smart lighting market owing to massive growth perspective provided to the manufacturers by this region and these lighting systems are extensively being adopted by the consumers in developing their household and making it digitalized. Increasing activities pertaining to construction in Asia-Pacific is extensively contributing to the growth of the market in the region. According to a recent report, it has been observed that the construction activities in China and India is going to undertake a rapid development that is expected to generate several growth opportunities for home automation and utilization of energy efficient lighting systems in this region. Furthermore, swelling implementation of energy efficient systems of lighting along with increasing expenditure on public infrastructure from the government organizations is expected to further drive the growth of the smart lighting market in Asia-Pacific at a rapid pace. Some of the key players operating in the global smart lighting market include Cree Inc., Hubbell Lighting Inc., Koninklijke Philips N.V., Osram Licht AG, Schneider Electric SA, Zumbotel Group AG, Acuity Brands Inc, Digital Lumens Inc., Honeywell International Inc., and Legrand SA.